Nov. 8, 2018: A fire burns at Iqaluit's NorthMart, the town's largest retailer and one of only two grocery stores. Imported food is very expensive in the Nunavut capital. Julie De Meulemeester is a Pulitzer Center on Crisis Reporting Student Fellow and medical student at McGill University. As a fire ripped through Iqaluit’s NorthMart on Nov. 8, the city’s residents were sent into a panic. The community’s largest retailer sold a vast array of items, ranging from clothes to prescription drugs, but was also one of only two major grocery stores catering to the city’s needs. Every summer, a cargo ship supplies Nunavut with most of its packaged and non-perishable food items. The NorthMart was therefore nearly fully stocked with new goods and wouldn’t be receiving another mass delivery until next year. All replacement goods will need to be flown in – a much more expensive and logistically challenging shipping option that would likely spike the price of already unaffordable food. So, while NorthMart’s storage unit went up in flames, it was easy to foresee the disastrous consequences it might have on the northern community’s access to food. 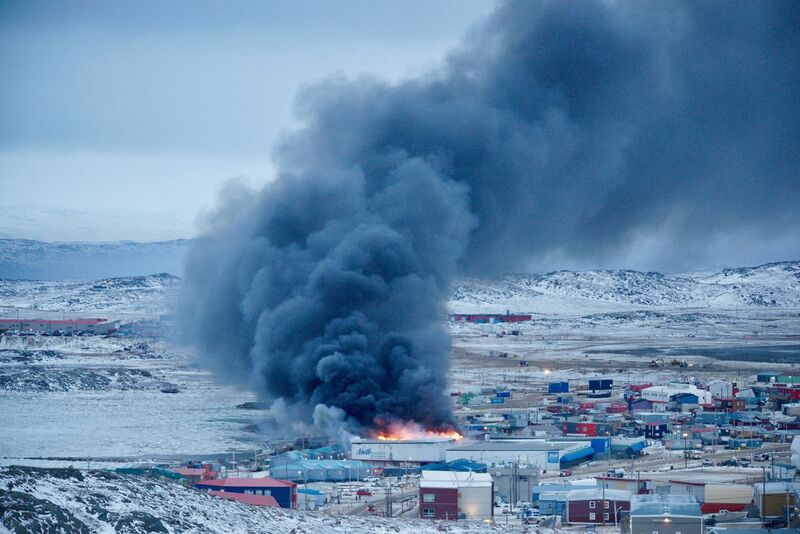 Alex Yeo, the president of Canadian Retail for the North West Company (NWC), has since announced that prices will not rise owing to the fire and that the NWC will work closely with other retailers to ensure Iqaluit’s needs are met. Dominic Leblanc, the Minister of Intergovernmental and Northern Affairs and Internal Trade, has also reportedly been considering the federally run Nutrition North program’s role in maintaining stable prices, along with different levels of government. However, the incident cast a momentary spotlight on Nunavut’s complex food-insecurity crisis, and a food system that relies too heavily on a handful of corporations and a grossly inadequate subsidy program. 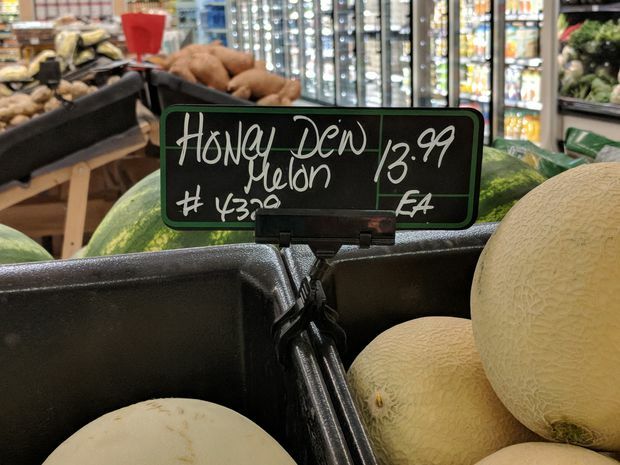 Honeydew melons, which would cost about $6 each in southern Canada, are on sale at Iqaluit's Arctic Ventures Marketplace for $13.99. 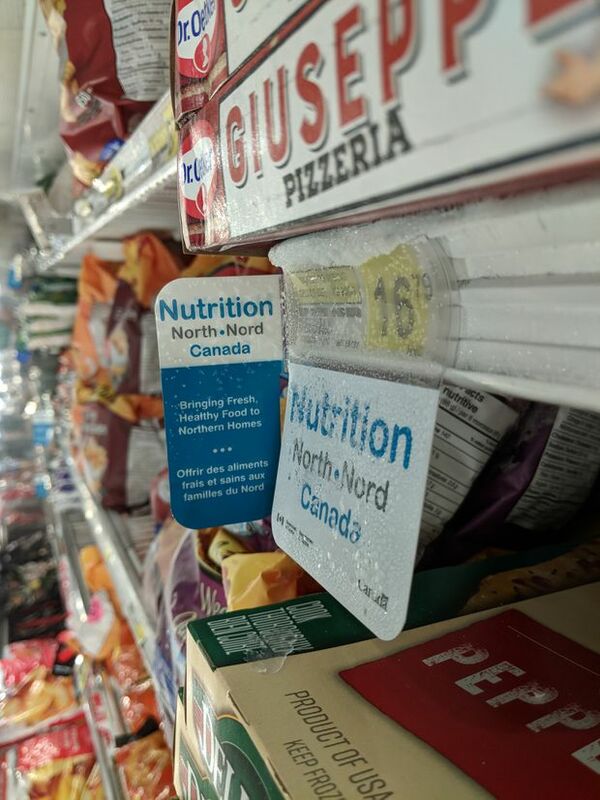 At a store in Pangnirtung, Nunavut, a sign for the Nutrition North program hangs above a frozen pizza (cost: $16.79). Inuit groups have been pressing Ottawa to reform the controversial subsidies for southern food flown into the North. Every year, the excitement is palpable in the weeks leading up to the SeaLift’s arrival, as the wait for vehicles, furniture and “fresh” packaged food comes to an end. “In fact, in May, June and early July, you’ll find the cheapest food at the stores. That’s because it’s all expired. And the nutritional value is probably not that great,” says Larry Journal, the director of income support for the Department of Family Services. With no road access to communities, Nunavummiut rely entirely on these deliveries and are constrained to paying merchant-set prices. Perhaps one of the most flagrant injustices is that the Nutrition North program that caters to the Arctic does not bring prices down to match those in southern Canada, even though the precarious situation of many Inuit – and the near impossibility of continuing to live off the land – is the direct result of historical oppression by the Canadian government. The cruel reality is that the Inuit are forced to pay for their isolation, whether that takes the form of expired produce, a $50 pack of toilet paper or a $70 watermelon. Nutrition North subsidizes healthy and staple foods (such as meats, fruits and vegetables, flour and cooking oil) sold by northern retailers, to help offset the high cost of importing them from southern suppliers and running a northern business. The subsidies are applied at the merchant or supplier level, with the expectation that savings will be passed down to consumers. But the program has received significant criticism from customers and researchers alike owing to its perceived lack of transparency. The list of subsidized items is also restrictive and culturally inappropriate, as it does not include harvested “country food” (other than from a few approved processors) and non-food items such as toilet paper. In fact, Amazon Prime, which unfortunately only caters to Iqaluit, is rumored to have affected food security more than any policy to date; for a relatively small membership fee, it allows Iqaluit’s residents to get free shipping on southern-priced food. Updating Nutrition North was a 2015 Liberal campaign promise. Last April, five major Inuit organizations (including the Inuit Tapiriit Kanatami and the Nunavut Tunngavik Inc.) withdrew from an advisory committee on Nutrition North’s reform, citing the federal government’s perceived disregard for their concerns and Inuit-specific recommendations. Months later, not all groups have returned to the table. Despite this, Mr. Leblanc said he hopes to be announcing changes to the subsidy program in the coming weeks. He has repeatedly mentioned his commitment to broad consultation with Indigenous groups but has not publicly outlined how he will re-engage with all these Inuit organizations. Another Liberal promise was the creation of a National Food Policy. The “What We Heard” document (summarizing the concerns and ideas that arose during their extensive consultation process across Canada) was released only a few weeks ago, and one of the priority areas emphasized by Canadians was access to food for Indigenous and northern populations. With these major changes to food-related programs and policies under way, now is the time for the government to re-engage in meaningful consultation with all the major Inuit organizations. It is imperative that the federal government cease its tokenistic approach to northern food policy and design programs based on the Inuit’s self-identified needs and priorities. Arctic char dries on the side of a house in Pangnirtung. Seal, beluga and other "country foods" are the traditional staples of the Inuit diet, and the custom of sharing food is still alive. On a rainy, summer day in Iqaluit, Nunavut, a busy mother of six has her hands full – she is caring for three of them, all under three years of age. Still on the stovetop are the remnants of a fried chicken and rice lunch. It’s the last week before her next Income Assistance and Canada Child Tax Benefit payments come in, and she is stretching what little food is left in the family’s pantry. The woman, who preferred not to give her name, attended Arctic College and used to work as a payroll officer for the Government of Nunavut but had to resign to care for her ailing mother. Then, she had to stay home to look after her babies. She is eager to return to work, but in the meantime, she borrows from close friends or relatives and sells hand-sewn amauti (traditional Inuit parka), among other belongings, on Facebook to earn some income. Still, it’s not enough. She says the family generally can afford to eat dinner, but that week in particular, with less food than usual, they’re eating just breakfast and lunch, or just lunch. She also turns to Facebook in search of nutrient-rich “country foods” such as seal or beluga. 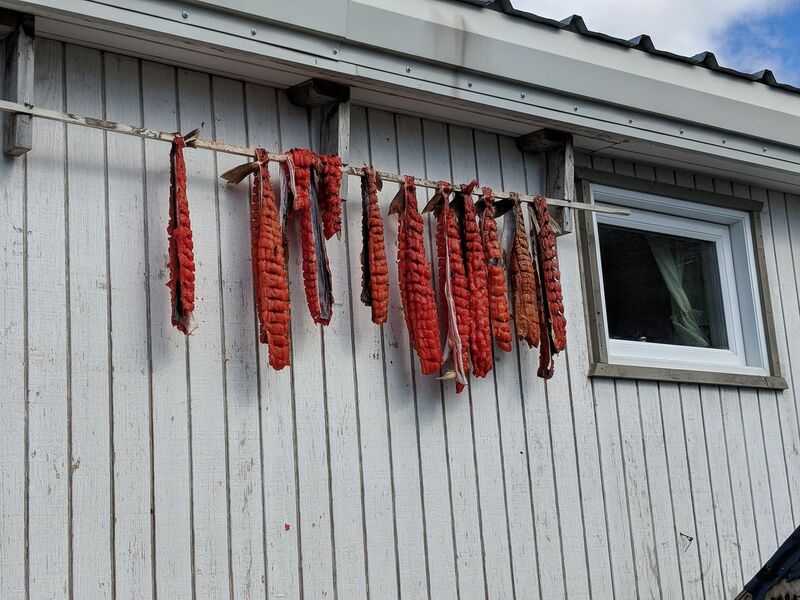 The age-old Inuit custom of sharing food has transitioned to the modern-day social-media site, where community members often post about cheap or free meat or fish. Her spouse is a laborer and hunter, but without the means to buy hunting equipment in Iqaluit – a boat, snowmobile, qamutiik (sled), truck, guns, ammunition, fuel, GPS and food – and limited hunter support funding, he is essentially too poor to harvest. Notwithstanding that the land was not meant to support such dense populations, subsistence hunting – a cornerstone of Inuit culture and seeming solution to Arctic hunger – has become a luxury that few Inuit can afford. Her three older children, ages 5, 11 and 13, are down the street at their grandmother’s, dyeing their hair. The at-home kit was a frivolous purchase to celebrate the 11-year-old’s graduation from elementary school. When they return home, the three-bedroom house will once again be at full capacity. The family of eight share their already-cramped subsidized house with a cousin and teenage nephew. A leaky pipe and mould have rendered one bedroom unlivable, so several family members sleep on a couch or a mattress on the living-room floor. The family spends around $400 a week on groceries. What would be a small budget for 10 people in southern Canada is meagre in the Arctic and leaves nutritious foods mostly out of reach. Baby formula alone costs them around $52 a week. She learned proper nutrition from her mother, but her eating preferences are still affected by the time she spent living with her father, who, she says, fed her junk food – whatever she wanted, cereal with water, pop, chocolate, candies. It’s the reason why, she says, she doesn’t have many teeth left. Seventy per cent of Inuit preschoolers are food insecure. And while Nunavut’s children are far from starving, many display signs of malnutrition rarely seen in other parts of North America – from nutritional rickets to missing or decaying teeth. In a country recognized for its universal health coverage and commitment to children’s rights and well-being, food insecurity is an unacceptable status-quo and yet another indicator that we are failing our Indigenous youth. Nunavut’s relative disenfranchisement has a historical basis. From the 1950s to the 1970s, the Inuit were victims of federal government policies and false promises that forced them to relinquish their nomadic, hunter-gatherer lifestyles and settle into communities. In one or two generations, they adapted to an entirely foreign system of education, housing and employment, all of which have affected access to food. “I’m the working generation,” says Yvonne Niego, Deputy Minister of Family Services. “My father was born on the land, he was born nomadically, he was born in an igloo. That’s how fast life has changed.” The rapid transition to store-bought food caused a disconnect between the elders’ traditional harvesting knowledge and the expertise needed to purchase and prepare nutritious imported foods, many of which do not even have Inuktitut translations. High-calorie processed foods are more filling and easier to prepare than perishables. Addressing food insecurity in Nunavut is a matter of abiding by the moral imperative that no Canadian child should go to bed hungry. Demanding anything less than robust, culturally appropriate food-security policies co-designed with the Inuit organizations is remaining complicit in the systematic abuse of the Inuit. And because it has been demonstrated time and time again that investing in tackling the social determinants of health (i.e. education, early childhood development, housing and food security) is less expensive than dealing with their downstream consequences, it is also a question of making sound economic decisions. Unfortunately, food insecurity is just one of a host of social problems that disproportionately affect the Inuit – entering Canada’s Arctic is akin to crossing a border into an expansive developing country with an incredibly high cost of living. 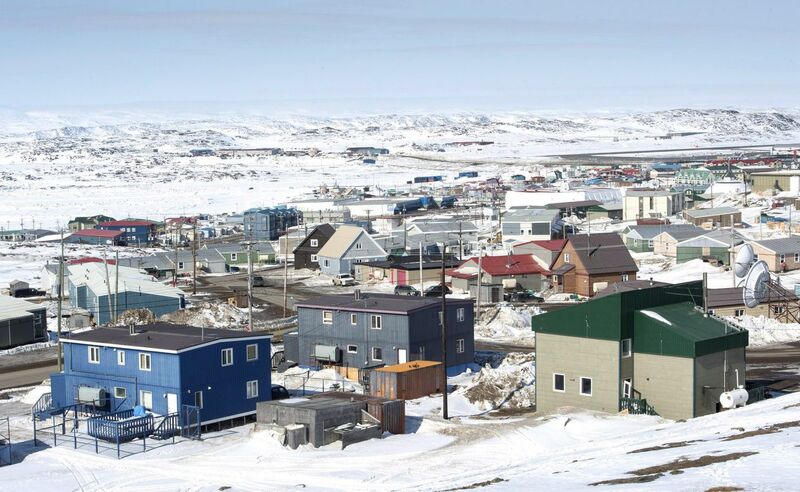 In fact, 52 per cent of Inuit in Inuit Nunangat (the term for the territory spanning four Inuit regions) live in overcrowded homes and only 34 per cent of adults have a high-school diploma (as opposed to 9 per cent and 86 per cent of all Canadians, respectively). And while non-Inuit earn a median income of $92,011 a year before tax in Inuit Nunangat, their Inuit counterparts are only making a median of $23,485. Income Assistance increased significantly on July 1, 2018. An individual in Iqaluit now receives $682 a month in basic benefits for groceries, with a 10-person household receiving $2,678 a month. However, according to Mr. Journal, these revised benefits only cover approximately 60 per cent of the actual price of food and are based on outdated prices from the 2016 Food Basket and Northern Food Survey. However, the Nunavut Food Security Coalition, which regroups the Nunavut-based stakeholders, has still been trying to tackle the issue since 2012. They have made progress on several fronts, including the implementation of a territorywide school breakfast program, according to Tammy Boutilier, the director of poverty reduction for the Department of Family Services. But with a lack of continuity in its representation and membership, as well as untimely food-security data to utilize, its potential has been stinted. Developing and expanding this coalition to support more grassroots organizations and community-led projects must be a focus for the territorial government. Many impactful initiatives such as community freezers and soup kitchens are tailored to community-specific needs but suffer from a severe lack of funding – which has had real-world consequences for northerners. It’s 11 a.m. in July in Iqaluit’s Qajuqturvik Food Centre and 22-year-old Marilyn Aupaloosie is hard at work making sandwiches and salad for the hundred or so lunchtime guests the staff expect at noon. The kitchen is bustling as the team prepares 300 portions of free food to accommodate those who come back for seconds or need to take a container home to their loved ones. The Food Centre doubles as a social enterprise; its “Inclusion Café” trains people with disabilities or little prior work experience to prepare them for employment. Along with the daily lunch served at the Centre, the staff prepare the meals for the local shelters and the free lunch delivered to the high school. Marilyn’s impressive set of cooking skills gives no inkling into her relationship with food growing up, when her family relied on the food bank’s bimonthly distributions of non-perishable items. “My mom always went to the food bank,” she recalls. “It was very rare for us to go to the soup kitchen because she was always drinking so much.” The absence of inpatient alcohol detoxification and treatment centres in Nunavut forced Marilyn’s mother to seek help in Winnipeg, far from her community. More than a decade later, Marilyn is struggling to find affordable housing despite her steady income. In Iqaluit, renting an apartment typically costs thousands of dollars a month, which leaves much less money for groceries. Several months ago, she signed up for subsidized housing: “A board member brought over the applications for housing, so I filled them out. More than half the people who were working that day filled one out,” she said. Iqaluit’s housing crisis means that as a single person, she’ll likely be waiting years before being offered a unit. In Iqaluit, as in the rest of Nunavut, poverty can be effectively a trap for residents already facing high costs for food. The main cause of food insecurity in the North is poverty – supermarket food can be several times more expensive than in the south, whereas the median salary and employment rates are much lower than in the rest of Canada. And for myriad reasons (e.g. inadequate child-care options, job shortages and a housing crisis), poverty in the North is an especially intractable problem. It is not easy to break the cycle. Programs meant to diminish poverty often look good on paper but are faulty in practice. In Nunavut, beneficiaries of income assistance must partake in one of several “productive choices” meant to inch them closer to financial independence. They include options such as harvesting (hunting, fishing and trapping), alcohol and drug counselling, mental-health counseling, employment-preparedness courses and family support. These options seem fantastic at face value, but many of the resources and infrastructures required to make them viable and robust are barely or non-existent in Nunavut. Other systemic flaws arise because of Nunavut’s most unique features: its Inuit languages and isolation from the rest of Canada. Approximately two-thirds of Nunavut’s residents speak an Inuit language as their mother tongue, but there is not a single federal web page (i.e. Canada Pension Plan or Old Age Security) available in Inuktitut. In the communities, earning an income that allows for food security can be out of reach even for those who are practically qualified. With jobs often limited to the Royal Canadian Mounted Police, health centres, municipality, schools, grocery stores and government services, “even now in 2018, you could be graduating school, you could have a desire to work, but until someone leaves their job, either voluntarily, or leaves the community to work somewhere else, or is fired or dies, that job doesn’t exist anymore,” Ms. Redfern says. Homelessness, too, is at the centre of food insecurity in Nunavut, as limited access to kitchens leads to a reliance on expensive ready-made food. A new transitional home for Iqaluit’s absolute homeless is in the works, but most homeless people in Nunavut are deemed ‘hidden’ – couch surfers without a permanent address. Immediate housing options in Nunavut include enrolling in Arctic College (where students and their families are offered an apartment) or scoring a job with the Government of Nunavut that includes housing. But the Inuit continue to be underrepresented in the latter option. Additional infrastructure (from housing to rehabilitation centres) and investment in strong poverty-reduction planning and programming is urgently needed. As all northern crises feed into each other, an unrelenting approach to poverty is required to truly tackle hunger. 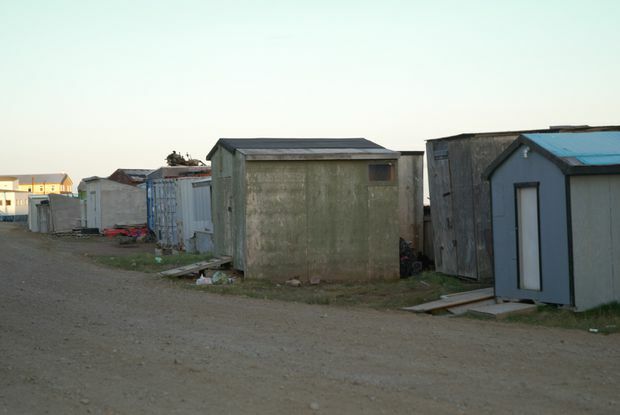 A stroller leans against the Iqaluit shack of the Pudloo family, where they lived after being evicted from their apartment. Grocery costs for their young children added up quickly as they came to rely on ready-made meals. Pauloosie Pudloo, his spouse and their five children (aged 10 months, 6, 8, 11 and 14) know poverty and homelessness all too well. When we met in mid-July, they had been evicted from their (standard-price) $3,050-a-month, three-bedroom apartment a month and a half ago and had since been living in a wooden shack on the beach. The housing authorities knew they were there, but with every public housing unit in the city filled, there was nowhere for them to go. In fact, Mr. Pudloo had been on the list for subsidized housing for the past six years. The shed was initially built by Mr. Pudloo and his father to store their hunting supplies, so it had no insulation. It offered adequate shelter in summer weather, but with temperatures dipping to minus-40 C in the winter, the family was getting desperate for permanent housing. They had a bucket toilet and used a Coleman stove for cooking and heating. The fumes from the stove were unbearable (short of being unbreathable) and they lived with the fear that their lantern would fall over and cause a fire – the demise of several other shacks that year. Mr. Pudloo sometimes sat aside and tended to the stove at night, which also made room for the rest of his family on their sole mattress. For the Pudloos, respite came in the form of cheap city-run day camps, kid sleepovers and sharing of country food: “There’s an elder here, every once in a while, he brings me a pound of seal meat,” Mr. Pudloo said. Since they had been homeless and relied on ready-made meals, the Pudloos’ grocery costs had gone up dramatically, with a dinner costing them around $90. And with a baby still on formula and in diapers, expenses added up quickly. In the summertime, Mr. Pudloo’s income comes from net fishing at Iqaluit’s causeway: “People usually call me and tell me they want some fish, then I’ll go put my net out. They usually want it in bulk.” Affordable and nutritious Inuit country food, of course, will never be in low demand.